Stress fibers are higher order cytoskeletal structures composed of cross-linked actin filament bundles, and in many cases, myosin motor proteins, that span a length of 1-2 micrometers . 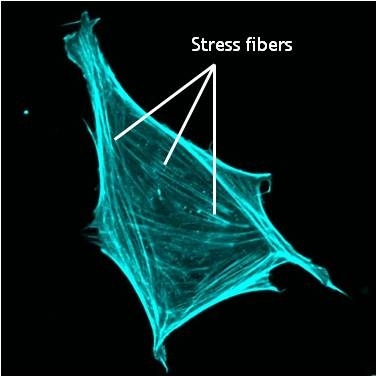 At least 4 types of stress fibers have been identified in mammalian cells . These are dorsal stress fibers, ventral stress fibers, transverse arcs, and the recently identified perinuclear actin cap, which is an important mediator in nuclear mechanotransduction. Each type of stress fiber is defined by their location in the cell, their morphology and their function at focal adhesions (reviewed in ). The presence of motor proteins in stress fibers enables contractility – an important factor in stress fiber function and in cell motility. In most cases, stress fibers connect to focal adhesions, and hence are crucial in mechanostransduction. In mammalian cells, stress fibers undergo continuous assembly and disassembly. This allows them to maintain cellular tension and undergo modification in response to various forces (e.g., mechanical stress ). A mouse embryonic fibroblast of the RPTPa cell line, plated on a fibronectin coated glass cover slip. The cell was transfected with RFP-Lifeact (a kind gift from Dr Roland Wedlich-Soldner, Max Planck Institute of Biochemistry, Germany), which labels F-actin in living cells. The cell was imaged using a Nikon A1Rsi confocal microscope at 60x magnification and false coloured cyan. Image captured by Wei Wei Luo, Mechanobiology Institute, Singapore. Stress fiber assembly can be described in a series of defined steps. Here, ~10-30 parallel actin filaments are bundled together via cross-linking proteins. α-actinin; for example,forms bands along the stress fibers  while filamin , binds uniformly along the length of the fibers . In ventral stress fibers and transverse arcs, bands of α-actinin appear to alternate with bundles of non-muscle myosins (e.g. myosin II) at a periodicity of ~1-2 µm . 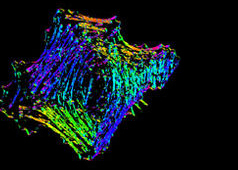 Although the contractile nature of transverse arcs and ventral stress fibers resembles the contraction of muscle sarcomeres, the organization of the actin filaments, actin binding proteins, and myosin bundles is considerably more random in stress fibers (when compared to muscle fibers) and the polarity of the actin filaments does not strictly alternate along the bundles  (reviewed in ). Besides myosin and α-actinin, stress fibers also contain many other proteins like fascin , caldesmon and tropomyosin , and regulatory proteins like myosin light chain kinase . The exact functions of the majority of these proteins in stress fiber activity and assembly are still largely unclear. Dorsal and Ventral stress fibers connect to focal adhesion and transmit contractile force. Transverse arc stress fibers drive retrograde actin flow in actively protruding cells. Transverse arcs (TAs) are found only in cells that are actively protrusive. TA appear as curved bundles of actin and myosin filaments behind the lamella. Unlike the ventral fibers, TAs do not interact directly with focal adhesions (FA). TAs have been implicated in actin retrograde flow from the leading edge to the cell center where they are disassembled . Dorsal stress fibers (DSF) are the main transmitters of contractile forces (as opposed to producers) to the underlying substrate. They attach to FAs at the base of the cell then rise towards the dorsal surface to form a loose matrix of actin filaments . DSF often terminate at a TA at their proximal end. It is important to note that DSF are suggested to serve as precursors of VSF and do not exhibit periodic distribution of α-actinin and myosin on the filaments (aka contractile bundle), so their identity as stress fibers has been debated (reviewed in ). 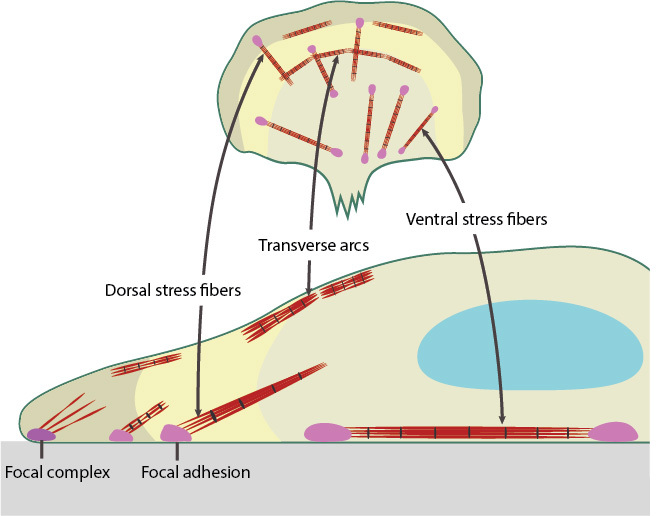 Ventral stress fibers (VSF) are filament bundles located at the ventral surface of the cell that are attached to FAs at each end of the bundle; these stress fibers extend from FAs close to the cell edge (i.e. lamellipodia) to an adhesion behind or near the nucleus (reviewed in ). The VSF are fundamental to tail retraction and cell shape changes during cell migration  and on their sides they can structure cell borders against inward pressure of the membrane . What are the steps in the formation of transverse arcs? What are the steps in ventral stress fiber formation? How do the mechanical properties of cells change with respect to substrate rigidity?